Traffic was crawling by Chestnut Ridge’s Village Hall Tuesday as voters packed the polls throughout the day. The majority voted to reelect incumbent trustees Grant Valentine and Paul Van Alstyne, who had drawn strong competition due to a January vote by the Village Board of Trustees to allow houses of worship in residential buildings. Many members of the Orthodox Jewish community had sought this accommodation and many non-Orthodox feared the increased traffic and busyness such changes in zoning would create. This led to what some called a classic clash of bloc votes as different communities fought for a vision of the community. Contenders Steven J. Wasserman and Anthony L. Shaut took umbrage to this characterization, claiming many Orthodox supporters in their ranks. In the end, the majority of the burgeoning religious community led Valentine and Alstyne to victory. Vote totals: Trustee: Grant Valentine (incumbent) 1,330; Paul Van Alstyne (incumbent) 1,314; Anthony L. Shaut 1,106; Steven J. Wasserman 1,129. It was a banner day for candidates backed by the broader Orthodox community. 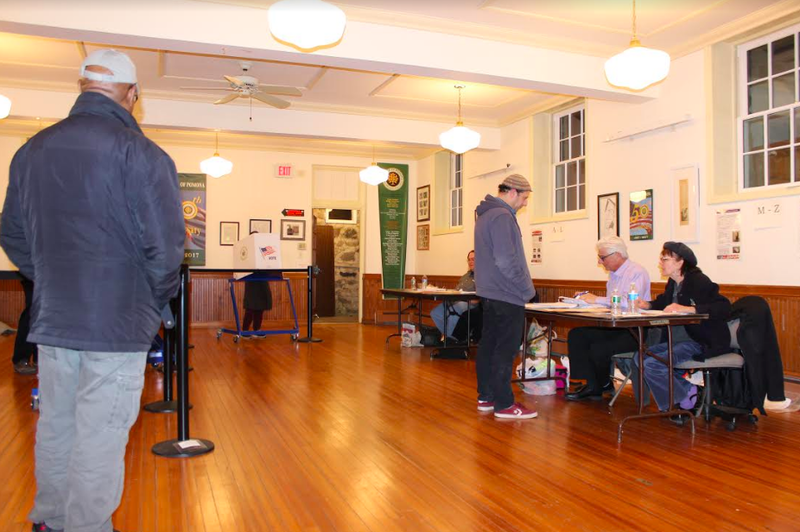 Voters filed into Ramapo Town Hall for the Village of Airmont election, which swept into power a regime backed by the bulk of the Orthodox community. Incumbent mayor Phil Gigante and running mates’ names had been taken off the ballot due to a challenge of their signatory petitions but Gigante waged a strong write-in campaign. Former Mayor Ralph Bracco’s slate came in a distant third. Vote tally in Airmont – Mayor: (W) Nathan Bubel 1,449; Philip Gigante 1,293; Ralph Bracco 152; Trustee: (W) Brian Downey 1,453; (W) Migdalia Pesante 1,455; Paul Marchesani 1,289; Anthony Valvo 1,285; Ronald Roberti 148; Angela Thompson 146. In the Village of Pomona, approximately 960 voters cast their ballots with the victory going to “Preservation Party” candidates. Trustee candidates Carol McFarlane, Elan Fuchs and Mayoral candidate Ian Banks were declared the winners. The Preservation Party slate was also considered friendliest with the burgeoning Orthodox community, though issues in Pomona are not necessarily seen through a bloc vs. non-bloc prism. Final vote tally, Pomona – Mayor: Ian Banks 435; Lloyd Ecker 312; Write-ins 231; Trustee: Ilan Fuchs 431; Susanne Kernan 311; Carol McFarlane 441 ; Joanne Robinson-Filas 321. In contrast to the chaos that went on in Ramapo Town Hall and the Chestnut Ridge Village Hall, Pomona was reasonably calm and quiet. Pomona has approximately 3,000 residents, 2,000 registered voters—less than half of those registered voted. The turn out from non-Haredi communities has remained comparatively small, even while it is common to hear residents of other faiths complain they are being pushed out of communities they have lived in for decades.